I’m writing a review of Chiroplanet after my recent experience of having worked with them on a chiropractor’s website who is now a client of mine. Within 2 months of working together, my client decided to move his site into WordPress. In this post, I’ll show you the drawbacks of investing in a Chiroplanet web development package. If you’re a chiropractor and you’re under contract with Chiroplanet, I’m going to educate you on what you’re really getting what the limitations are. If you want to generate new business leads from You’ll see that if you’re interested in aggressively marketing your business in Google and other search engines, Chiroplanet’s system is limited – in ways you might not know. His previous website was designed and hosted by Chiroplanet in a contract in which he was bound for a minimum of 3 years, paying $80 per month. That’s a total of $2,880 paid over a 3 year period. For this, my chiropractor got a fully functioning website that was ready to go. All content was loaded for him and he was given backend access, so he could add more of his own content through Chiroplanet’s Client Admin Portal. Support was provided if he had questions. 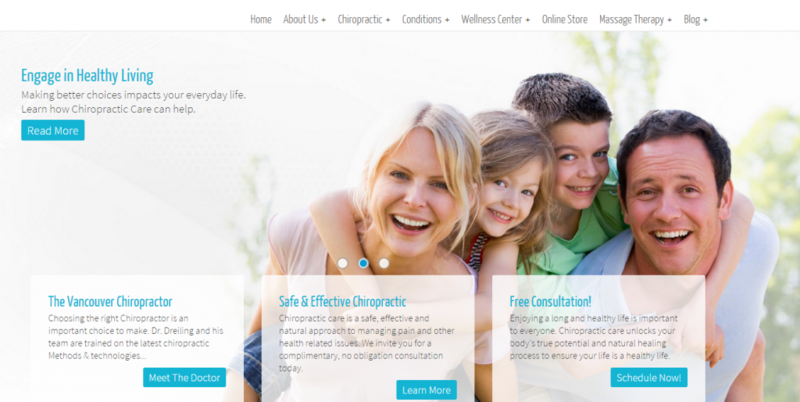 In taking over the online marketing for the chiropractor, I got to work with the sales and support staff at ChiroPlanet and I got to make my own edits to the website. Meaningless URL extensions. A URL extension (what you see after the .com/) should give you an idea what the page is about. As you can see, Chiro Planet’s URL extensions are random numbers. Not only is this URL more helpful for humans, it also helps your page rank better in Google. Duplicate Content. All of the content provided by ChiroPlanet is the exact same content that appears on every other chiropractor website sold by them. According to the latest research, 9% of men and 12% of women in the U.S. experience at least 1-2 headache episodes per month. Google turned up 119,000 other websites with the same sentence. Guess what? They are all Chiroplanet websites and not only is that sentence replicated on every site, so is every single page they give you. You can test this yourself. You probably have sections on your website for Conditions, Wellness, and Chiropractic. Copy a sentence from any page of those sections and Google it. See what you come up with. The reason this is a big problem is that duplicate content is a no-no with Google. Those duplicate pages will never outrank your competitors in Google who are publishing unique, quality content. While it’s hard to prove, it’s even possible that Google might not rank your website at all for any chiropractic searches due to all of the duplicate content on your site. But Chiroplanet doesn’t tell you this. You think you’re getting a nice site, but you’re really just getting a cookie cutter site with the same content as everyone else. As a chiropractor, there are plenty of keyword phrases and topics you can get found for in Google that could turn into new patients. But if you’re using Chiroplanet’s regurgitated content, you’re not going to generate new business from any of them. These two issues will have a huge impact on your SEO. 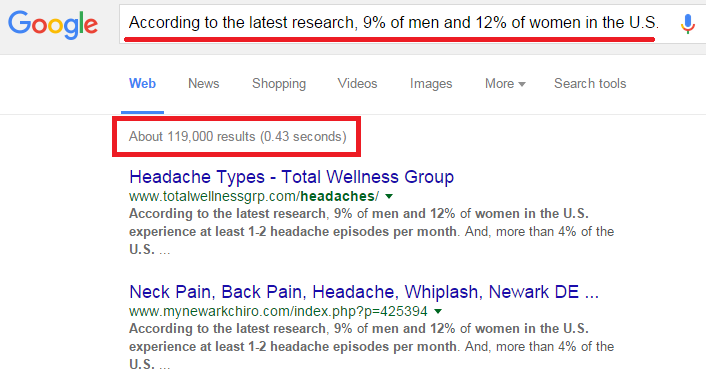 At best, your home page will appear in local Google search when people look for a chiropractor in your area. At worst, it won’t and that could have a lot to do with Chiroplanet giving you the same content they give every other chiropractor they sell to. It’s also highly unlikely that you’ll rank for ancillary keywords or conditions. You need unique content to do that. No Blog. Chiroplanet does not support a normal blog platform and therefore, each new blog post gets added to the drop down menu. This is a clunky design issue that is pretty outdated. A dropdown with 8-10 options is acceptable, but after you publish more and more posts, the dropdown list is never ending. It becomes unsitely and very difficult for your visitors to find what they want. You probably don’t have a blog on your site because Chiroplanet does not support the it. We gerry-rigged this blog (see image) for my client because we know how important blogging is to increasing traffic and leads. The right way to setup a blog for design and useability is just a click away! Go to the top of my website and click on the Blog in the top navigation. Notice how there is no unsitely drop-down. Instead, you’re taken to my main blog page where you’ll see a nice looking lists of my latest blog posts including an image and an excerpt. Isn’t that nice looking? Go ahead and read one, they’re very informative! Mine is what a blog should look like. If you care about the way your website looks to new patients, you’re going to want to have control over your blog and have it look nice and professional. Horrible CMS. CMS stands for content management system and its the back end interface where you can add and optimize new and existing content. I can tell you from experience that Chiroplanet’s CMS is one of the most frustrating ones I’ve worked with. I had one hell of a time trying to get content to look the way I wanted it to look using their visual interface. Everytime, I had to use the HTML editor to try to fix the content so that it looked nice. And if you’ve ever tried to edit web pages using an HTML editor, you know it is a tedious process. The end result is I spent 2-3 times as much time as I should have uploading, formatting and publishing content. It’s really unacceptable to waste so much time on this process when companies like WordPress have set the standard for ease of use when it comes to publishing great looking content. If you’re not in the practice of adding content to your website, you probably don’t care about this section. However, if you know your website is a living, breathing thing and that adding fresh, quality content is the best way to separate yourself from your competitors, then you’ll soon become frustrated at the time you’re spending trying to get your new content to look the way you want. Customer service is the area where Chiroplanet really fails. then you’ve likely found a page that was never re-directed properly. When search engines find pages that no longer exist, unlinked pages, or pages that weren’t re-directed properly, it’s recorded as a 404 error. Since missing and broken pages make for a poor user experience, Google can penalize your site if you have a lot of these errors. It took me over 2 weeks to get Chiroplanet to properly perform a 301 re-direct for me. I’m used to having control of this myself. In WordPress, this takes 30 seconds to complete. First, they told me they couldn’t do it. I told them as an SEO, that is entirely unacceptable. I sent them instructions on how to do it. I followed up via email and was ignored. When I followed up again a few days later, they told me they could do it, and they would let me know when it was done. A week later, I had to follow up again to finally get it done. Holding Domain Hostage. I’ve saved one of the worst offenses for last. As my client tried to transition from Chiroplanet to WordPress with a new site, the staff there made it very painful for him to switch. They held his domain name – HIS domain name – hostage and wouldn’t release it until his entire contract was paid in full. This move cost my client thousands of dollars and lot of waiting and back and forth anguish. At least now he is free and clear and of course working with us where his site will thrive! If you Google “Chiroplanet Reviews” you will see a couple of postings on RipoffReport that make similar complaints. I did have a few positive experiences with their customer service staff. They were helpful in some situations. But to delay and not communicate about something as simple as a 301 re-direct is inexcusable. And the hardball tactic of holding your domain name hostage is reprehensible. It got so ugly, my client had to threaten legal action. It should never come to that. Of course, Chiroplanet is a competitor of mine, so you may think my review is jaded. Or, perhaps you’re a chiropractor who shares my dissatisfaction with them. More likely, you’re in the majority of people who don’t know what they don’t know when it comes to online marketing. That’s ok – you’re not alone. Most business owners are slow to learn (or care) how Google and websites work. All they care about is operating a good business and generating new leads through ethical means. The problem is that the world is now digital and except for referrals, getting found online is going to be the #1 way you’re going to generate those new patients. For my money, Chiroplanet has a lot of limitations when it comes to marketing your business. If you think your website is just a static thing, I encourage you to learn more about it here or from other trusted sources. It’s your 24/7 salesperson and if you invest some time and money into marketing it properly, you can do very well online.